For my latest electoral prediction, click here. A lot of my Republican friends (yes, I admit to having some) are feeling very confident about the 2012 election. 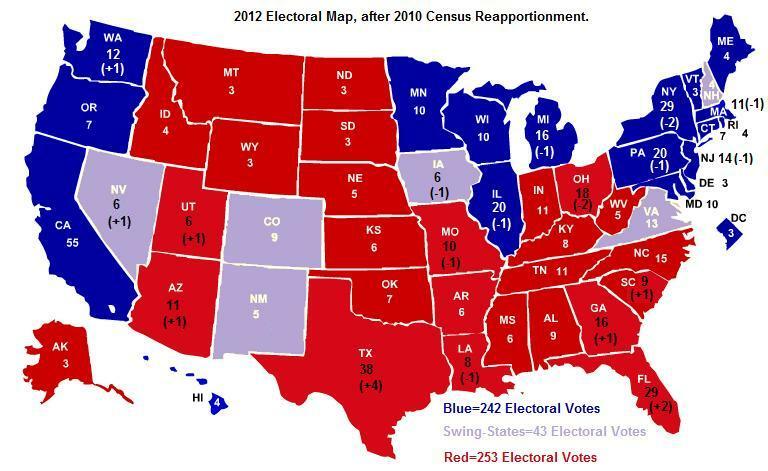 They’re not quite measuring the drapes in the Oval Office, but this electoral map seems to be their “worst-case” example of how the states will break in 2012. Notwithstanding my reasonably accurate 2010 election predictions, I don’t think I’m an expert on politics. But that’s never stopped me from commenting on things beyond economics, so here’s why I think Republicans are prematurely giddy. First, while I certainly agree that Obama is much less popular than he was in 2008, that’s not terribly important since the election is still more than 18 months away. Second, we don’t know what the economy will be a net plus or net negative next year. There’s a lot of evidence that people vote on pocketbook issues, and it appears that disposable income is an important variable. If we manage to have any sort of growth, even sub-par growth of perhaps 2.5 percent annually, that may be enough to make people more comfortable and to bring unemployment down close to 8 percent. If that happens, Obama will claim he brought the nation back from the brink of a second Great Depression. The fact that his policies actually retarded the recovery will be overlooked. Third, you can’t beat something with nothing. Barack Obama’s secret weapon is the names on this list. I haven’t seen any problems with the degree of fiscal conservativeness on domestic policies. What problems I do have are well out-weighed by the positives I see. He, and many of my fellow Libertarians, are wrong when it comes to International relations and national treaties. I’ll stick with Ayn Rand instead of the immature ideals that approach anarchy. Then there is the question some have brought up about a racial statement he made years ago. But the issue smells too much like political mud-flinging so I’ll won’t let it alter my opinions. I voted for Ron Paul in 2008 and if he decides to run again I probably will again. I’ve been on the Big Government blogg and they hate Ron Paul over there. They claim he is not a strict fiscal conservative and is not a strict constituionalist as well. holy crap! If that’s our only choices, we’re doomed. My choice is Gary Johnson or Ron Paul. But I don’t know if “the people” truly understand the direness of our situation and are ready to do the right thing yet. I’m not the only one who is looking to remove President Obama but doesn’t have a replacement at his finger-tips. I Ron Paul runs on the republican ticket again I may have to re-register. The names on the list is absolutely a key in 2012. First….please Sarah Palin do not run! There is way too much at stake. She was a gimmick in 2008 and would have been in charge of the Easter Egg Hunt at Easter. To her credit and the stupidity of the Nut Cake evangelican right she has been cashing in. Rudy Gulianin pleeze we know you were in charge during 911 and Fred Thompson the flem king [when asked a question he would cough up some flem then lay some buzz words on you] stick with your radio show. So who is it going to be?? ?